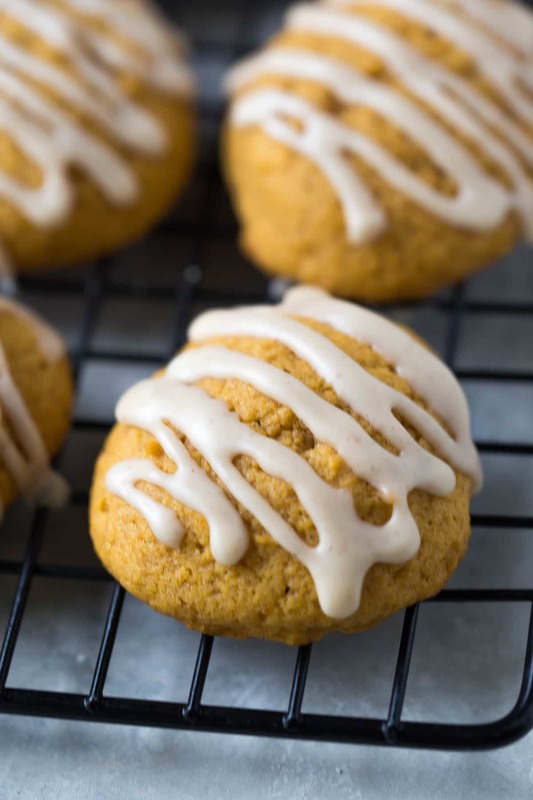 These dairy free pumpkin cookies are perfect little bites of pumpkin spice goodness and drizzled with just the right amount of maple cinnamon glaze. 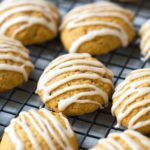 A few years ago, I shared my favorite pumpkin cookies. I thought they were the best thing in the history of ever. 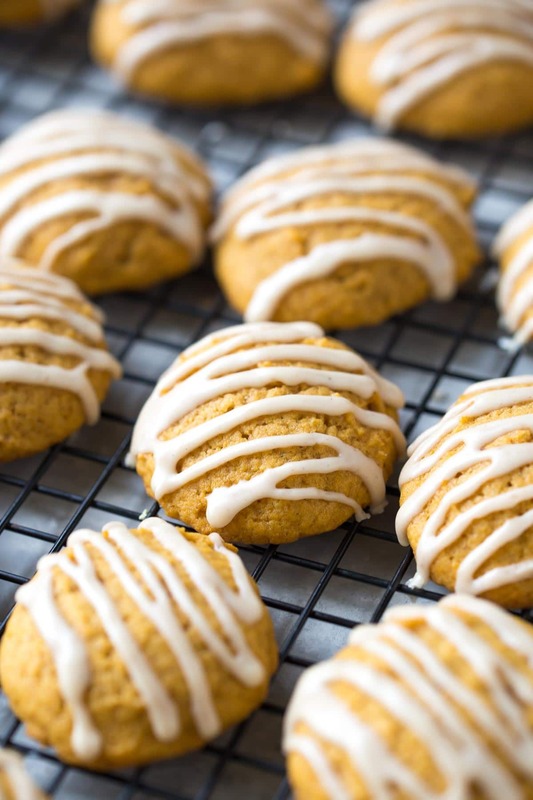 I shared them with all of my friends in France, who had never really tried a sweet pumpkin recipe, and they were all pleasantly surprised. I mean, how could they not be. There’s a reason almost all Americans become pumpkin obsessed (both sweet and savory) on the first day of September every year. Now that we’re dairy free, those cookies are a thing of the past, but don’t worry. 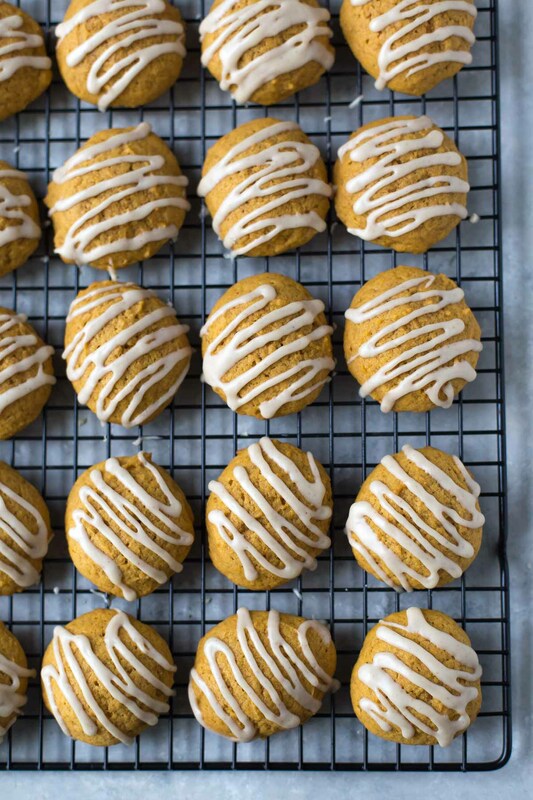 I’ve swapped things out and revamped our frosting to make little pillow balls of pumpkin goodness without the butter. Thank you coconut oil for making everything better. I might have to say that I like these ever better than the original recipe. They’re a teensy bit less sweet, but I think that’s just because they aren’t coated in a thick layer of heavy frosting. Instead, I’ve opted for a drizzled glaze, allowing you to taste the flavor of the spiced pumpkin just a little more. But, if you’re super into frosting, which I know many people are, feel free to drizzle a little extra. 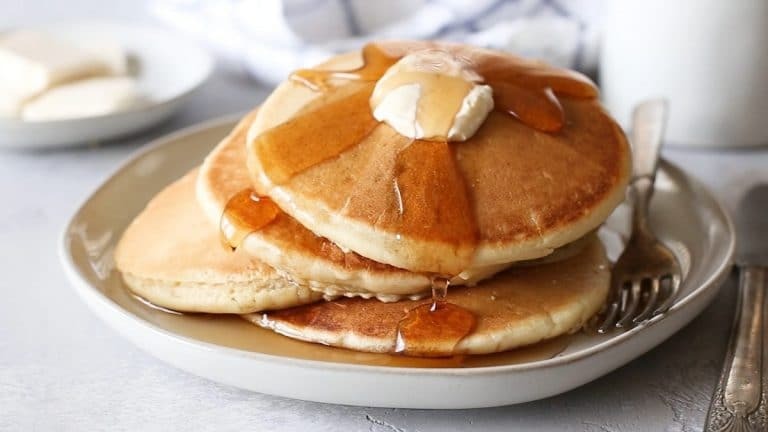 The recipe makes enough to do that, and you can always double it if you want. About the coconut oil. Just to be safe, I want to clarify that I did not melt the coconut oil. I popped mine into the microwave for about 10 seconds to soften it up because I wanted it to be the consistency of softened butter. Don’t melt it or this recipe will be all sorts of off. Other than that, this recipe is pretty simple, and you’ll have 36 delicious cookies to share (or eat all by yourself). 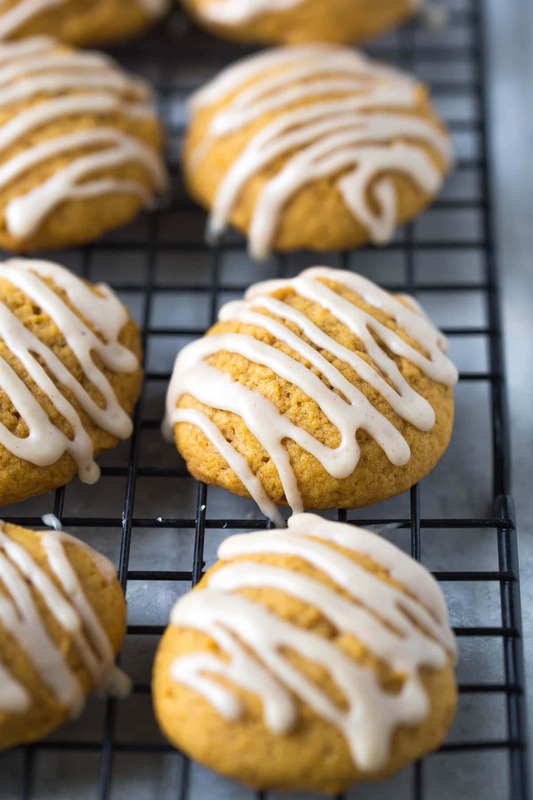 And, if you’re not ready to give up on fall yet this year, why not make these dairy free pumpkin cookies and these along with your usual Christmas cookies. Preheat oven to 350° F (180° C) and line a baking sheet with parchment paper. In a large bowl with an electric mixer, beat coconut oil with sugar, pumpkin pie spice, salt, baking powder and soda at medium speed. Beat in egg, vanilla and pumpkin, until combined. Add flour in 1 cup increments, continuing to beat at medium speed until all flour has been combined. Place tablespoon-sized balls of dough on a parchment-lined baking sheet about 2 inches apart. Bake for 12-14 minutes or until cookies have fully set (an inserted toothpick should come out clean). Allow cookies to cool for a minute before transferring to a cooling rack. In a medium bow, whisk together glaze ingredients until smooth. When cookies are fully cooled, drizzle glaze over cookies using a whisk, spoon or pastry bag with small tip. yes, yes, yes PLEASE!! Pretty and delicious. Nobody will miss the dairy!